The word on everyone's lips is Micellar Water. Why would you pay for water when you can get it out of the tap for free? Basically, Micellar Water is my new holy grail product and I love it so much I have to share it with you so you can love it too! It's all a bit of gobbledygook to me- (I was never great at Chemistry) but to break it down in layman's terms for everyone, Micelles are basically spherical little clusters that love to eat away and catch all the makeup and oils on your face. They are different from an ordinary makeup remover which also breaks down your makeup but doesn't absorb it like a Micelle molecule would, so you end up actually smearing it all over your face. Nasty! There are tons of various Micellar Water products on the market at the moment from brands such as La Roche-Posay, Vichy, L'Oreal, Avene and the ever popular Bioderma. Today I'm here to talk to you about the Garnier Micellar Water which for a 400mL bottle retails for about $12 here in Australia. It is readily available at Priceline, Kmart, Target and Big W. I find that sometimes I can buy it cheaper outside of Priceline and I have seen bottles at Target for around $9. Don't sweat it though, Priceline always have sales and discounts for this product too! This Micellar Water takes off my makeup like a dream, albeit it does struggle with my mascara but I prefer to use something even gentler on my eyes and usually opt for a cleansing balm/ oil. The biggest plus for me is the fact that this product is fragrance free. For me, mixing heavily fragranced products and skincare is never a good combination because you never know what chemicals are actually going in to make that 'fragrance'. Ever noticed on the back of your bottles it just says 'fragrance' or 'perfume'? Yep, that's because companies don't have to disclose in writing on the product what they use to produce this 'fragrance' because it's a company secret. It's for this reason I try to steer away from fragranced skincare and I have quite sensitive, blemish-prone skin and I would prefer not to aggravate it. I don't think I will be able to get exactly 200 uses like the bottle claims but it would definitely be somewhere close and dependant on how liberally you use it. For the price and product I would say that this product is definitely great value for money. Every time I hear someone talk about using makeup wipes to remove their makeup and cleanse their face it's like nails on a chalkboard. I feel it's just so abrasive to keep rubbing your skin to try and remove your makeup- especially the sensitive skin around your eyes. OUCH! Now you have no excuse, this product is affordable and perfect for the laziest of lazy's! You can even remove your makeup from the comfort of your own bed! Go and invest in your skin now, it's the only one you've got! 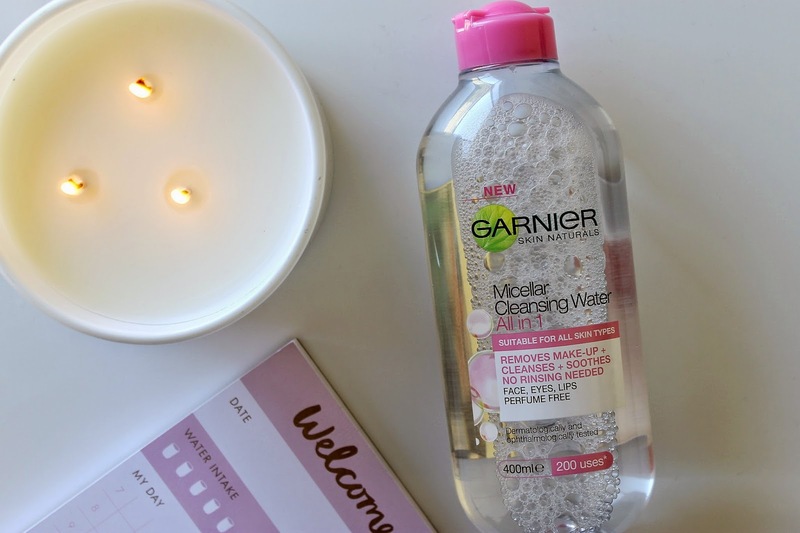 Have you tried the Garnier Micellar Cleansing Water? If not, is it something you would like to try? Yes! I've tried that too! It's quite similar to the L'Oreal Eye Makeup Remover too! I've wanted to try this for ages but I've never had the chance! Wipes are too drying on my skin so I think this would be the perfect match for me! Great review! Micellar Water has literally changed the way I take off my makeup! How do you use it? With a cotton ball? I hope you do try it, I think it's something everyone needs to invest in for their makeup bag! This is something I am going to consider as I really do need something good to remove make up from my eyes, particularly eye make up. Hopefully it'll be in a store in Ireland. Thanks gorgeous girl, I have done it but I will check yours out anyway! Basically you use it on a cotton pad to remove your makeup with no rinsing needed! It doesn't leave an oily reside like some makeup removers so there's no need to rinse either! I do like to follow it with a cleanser though for a deeper clean. Yay! Hooray for Micellar Water! Love micellar water! No rinsing required. I have Créaline, but I know that it's not widely available sometimes. Nice to know that this alternative is pretty good! GRWM: Dinner Date | Hair & Makeup! January Haul + FREE DOWNLOAD!